I did this once before and people appeared to enjoy it, so when the latest box of Norm Breyfogle art appeared on the doorstep I just knew it'd be interesting to engage in the same exercise and show people how art is assembled, and in this case why not pick an album cover? 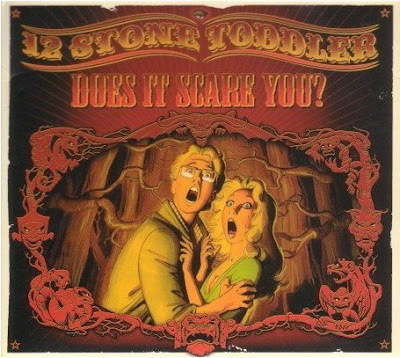 I'm happy to confess that I know next to nothing about the band 12 Stone Toddler, other than they have a great name, and that Norm has now designed an album cover, Does It Scare You? and a CD single cover, Twang, for them, all of which I now own the original art to. Hey - someone had to buy it and it had to end up somewhere. Bob Geldof is totally right. I'll still be doing my bit for the environment in this might cause to help Al Gore get elected to something (and let's not forget that his wife spearheaded the campaign to eliminate the music of the likes of Frank Zappa from the globe, not that it worked) by reducing my carbon footprints for the day. How? Easy - I'll turn the TV off. I urge everyone else to do the same. Save the planet - reduce your carbon emissions, don't watch this over hyped crap. Why the title? Because I know that seeing this image is going to drive my great pals Chadwick and to a lesser extent Tobias (because I doubt he'll give a flying rats arse) batshit. Now he'll spend the rest of the day, whenever he sees this, trying to find out just where the hell it appeared, and what the hell is going on. Even better to confuse the man, here's one of several costume designs for Captain Jack Harkness. 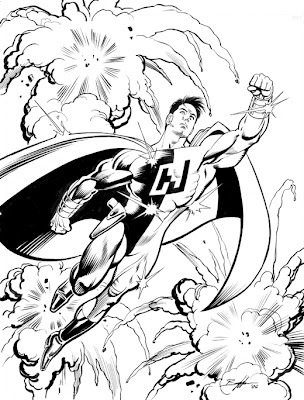 So, Chadwick, he who knows all, can you work out why Norm Breyfogle is drawing good ole Jack? Let's start the new financial year off with a bit of a bang. 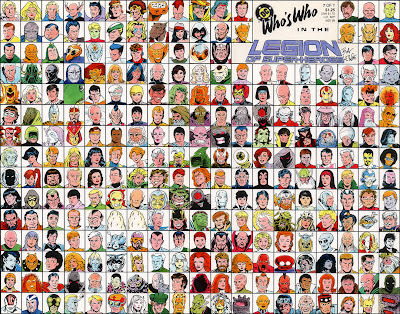 From the pen of the Former DC Staffer comes this look back at the Who's Who In The Legion Of Superheroes. Interesting stuff to say the least and more proof that not everything is as it appears, but then we all learnt that lesson a long time ago. Just because it glitters on the surface doesn't necessarily mean it's gold underneath. Over to the Legion! Is there such a thing as Too Much (Alex) Toth? I don't think so. I bought this postcard not that long ago. I guess it's the closest I'll ever come to owning an original Toth Space Ghost - can't complain and indeed I won't. I've now finished my stint as a full-time day job worker and am back to part time. Thank Christ for that. I have to admit that I was getting rather sick of the whole thing. I have things to do, and at the end of the day after the tax-man and the ex have dipped their beaks into what I earn I was only making a paltry $200 more per fortnight than what I'd earn working half the time. So if I've not replied to an email, keep the faith. Replies will be forthcoming.